Today I have good news for all users of kalmstrom.com SharePoint Solutions, as they soon will be offered a free archive tool. SharePoint users who don't subscribe to a kalmstrom.com Solution yet, will have a possibility to subscribe to the archive tool separately at a low cost. SharePoint is an important platform for the kalmstrom.com Solutions, and more and more of our products are given a SharePoint option. Our first SharePoint solution was an Outlook add-on that converts e-mails into SharePoint list items: HelpDesk OSP, released in 2009. 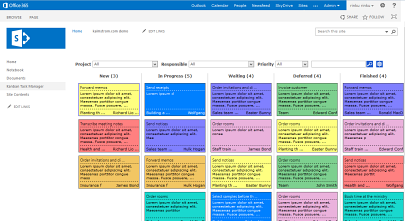 Today KBase (knowledge base) and Kanban Task Manager (kanban style application for project and task management) work with both Outlook and SharePoint. We will continue on this path. Currently we are developing a SharePoint version of our time tracking tool TimeCard, and when it has been released we plan to update Calendar Browser and Folder HelpDesk with a SharePoint sharing option. When we develop the kalmstrom.com Solutions we always try to make use of the functionality Microsoft has already integrated in the platforms we build on. This makes our products easy to learn, and our aim is that everything you normally do in Outlook, Excel or SharePoint should be possible to do in the same way with your kalmstrom.com Solution. However, in the case of archiving SharePoint list items with a workflow we want to give another method. The tool we are planning does not require a workflow creation, and it will be beneficial to all organizations that use SharePoint. The kalmstrom.com Tip on how to build a workflow that archives old SharePoint list items was first created for SharePoint 2010, and now we have a version for SharePoint 2013 also. This tip has become very popular, but unfortunately the simple workflow I show in the demo cannot be used for Kanban Task Manager tasks. Even if these dragable, colorful tasks are just standard SharePoint tasks with some extras, they have dependencies that must be taken into account when creating an archiving workflow. That makes the workflow much more complicated to create, so we have decided to instead give subscribers a free archive tool. The archive tool will not be given only to Kanban Task Manager users but also to subscribers of HelpDesk OSP and eventually TimeCard, Calendar Browser and Folder HelpDesk when their SharePoint versions have been released. A solution that archives SharePoint list items will be useful for all these subscribers, and it will be easier to handle than a workflow. The SharePoint archive tool will read information from a SharePoint list, based on user selected filters, and copy all the information into a database or SharePoint list. There will be an option to remove all the data from the original SharePoint list. I guess most organizations want to use that alternative, but it should still be optional. The development will be done in two steps. The first version will only copy the data to an Access or SQL Server database. In the second version we will add a possibility to copy the data to another SharePoint list instead. We will market the new archive tool as a new kalmstrom.com Solution, and for organizations who are not Members of the kalmstrom.com Community it will be possible to subscribe to the tool separately. We hope to release the first version of the kalmstrom.com archive tool for SharePoint in about two months, and I will come back with more news about it before that.